The booklet consists of two parts: 1- The Concepts & the Objectives: defines the early childhood care and development approach. This part is a comprehensive program of concepts, policies and activities for children from prenatal to age 8 or 9. It identifies the principles of the approach in its Arab context and its integrated comprehensive context, as well as how to contribute to the process of setting the outline of an early childhood plan. 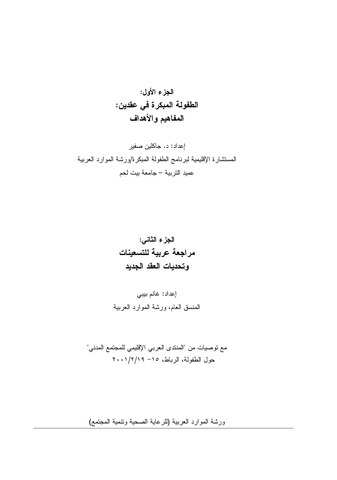 2- An Arab review of the nineties & the challenges of the new decade: Tries to present the background of working in the field of early childhood and gives an overview on international, regional and local circumstances and commitments, towards reviewing and planning. Developed by Jacqueline Sfeir and Ghanem Bibi.